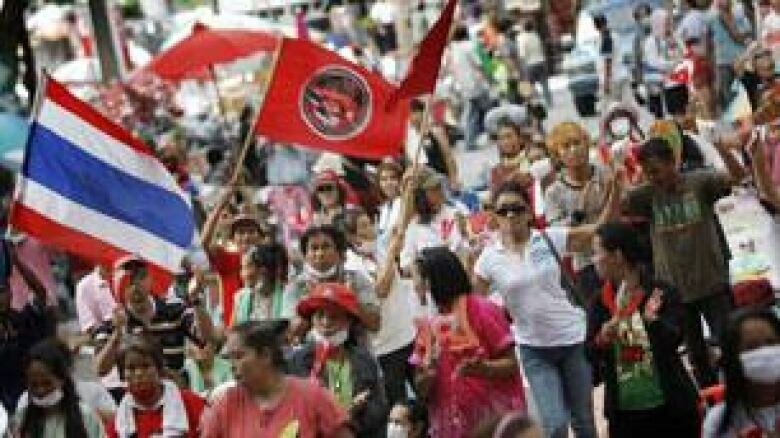 Nattawut Saikuwa, a leader of the anti-government Red Shirt movement in Bangkok, is reported to have contacted a government official late Monday to discuss a possible ceasefire amid the violence in Thailand's capital. The tense standoff between soldiers and anti-government activists in Bangkok may have a chance of easing amid reports of possible ceasefire talks. The Associated Press reported that Nattawut Saikuwa — one of the leaders of the group of protesters known as the Red Shirts — contacted a government official late Monday to discuss a possible ceasefire. Korbsak Sabhavasu, the government's chief negotiator, said he had spoken with Saikuwa for about five minutes, and that the Red Shirt leader had proposed a ceasefire. Korbsak said government troops would stop firing if the Red Shirts pull back to a central area. "If they call their people back to Rajprasong, there will be no single bullet fired by the soldiers," Korbsak said. Rajprosong is the the three-square-kilometre area in central Bangkok where the activists have their protest camp. Saikuwa's response was not immediately known. Meanwhile, thousands of anti-government activists continued to defy government orders to clear out of the encampment, choosing to stay behind their makeshift barricades. Military officials gave protesters until 3 p.m. local time Monday to clear out of the protest zone, where thousands of people have been camped out since mid-March. Some protesters — many of them women and children — moved out of the camp ahead of the deadline, but as many as 5,000 ignored the order. But after five days of clashes that have killed at least 37 people, signs emerged Monday to suggest government officials and protesters may be considering ways to end the violence. The Canadian Embassy in Bangkok has been temporarily closed to the public because of violence in the area, the Ministry of Foreign Affairs said. In case of emergency, Canadians needing assistance can call 001-800-220-0142 or 02-636-0540. A state of emergency is in effect for Bangkok, and the Ministry is advising Canadians to avoid non-essential travel to the capital and other areas of the country experiencing violence. Ron Hoffman, Canada's ambassador to Thailand, said that between 8,000 and 10,000 Canadians live in Bangkok, and many Canadians visit the city. "For now, we believe that our consular advice — to only come to Bangkok if absolutely essential — is the right advice, but we’ll be prepared to ratchet it up if circumstances require it," said Hoffman. Authorities have yet to move into the camp, but security forces have set up a number of checkpoints around the protest area in a bid to stop supporters from moving into the camp. The checkpoints also allow the government to control the flow of supplies in and out of the camp, the CBC's Michel Cormier said. "You have a siege mentality in this town as the government tries to stand firm and wait out the rebels," Cormier said. As night fell Monday, explosions and gunfire rang out near the protest site, and reports suggest at least one protester has been shot by a government sniper. Earlier Monday, Nattawut dropped a previous demand for the United Nations to mediate in the talks, saying the government could appoint a neutral body for the task. But the government stuck to its stand that the army will not pull back until the protesters stop attacking them. "The protest has to stop. Clashes have to stop. 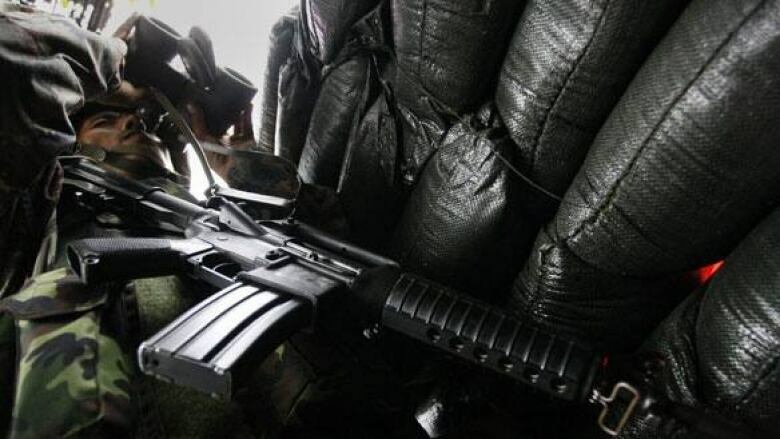 Activities that threaten security of the general public have to stop," government spokesman Panitan Wattanayagorn said. As the deadline approached, the government aired television notices and dropped pamphlets in the protest zone urging people to leave the camp, noting that people who refuse to clear the area will be violating the law and could face a two-year prison term. "Over the past 24 hours, tactics on both sides have become more deadly," Canadian journalist Michael McAuliffe said from Bangkok. "Soldiers have abandoned their use of rubber bullets and tear gas and are now firing live ammunition directly at anyone moving around the protest perimeter." Troops and army sharpshooters have surrounded the three-square-kilometre area in downtown Bangkok, where anti-government demonstrators have erected barricades of tires, sandbags and bamboo spikes. Maj.-Gen. Khattiya Sawasdiphol, a rogue army officer who was shot in the head last week by an unidentified sniper, died from his injuries Monday, raising fears that his death could spark more violence. The Red Shirt demonstrators believe Abhisit's coalition government came to power illegitimately through manipulation of the courts and the backing of the powerful military. They are demanding he dissolve parliament immediately and call new elections. The crisis had appeared to be near a resolution last week when Abhisit offered to hold elections in November, but the hopes were dashed after Red Shirt leaders made more demands.